I don’t allow restrictions or fears to limit my life! Life is worth living, after all, and I’m going to live every day like it is my last. Most people create a bucket list because they are dying but I created one because I want to live. I’ve avoided one bucket list item, however, that brought such fear to my very core that it controlled me. I couldn’t get over the innate fear that crept around in my mind like a virus. Their endless, massive teeth, their boneless bodies, their quick ease of movement to attack, and their dominance in the water make sharks, regardless if they are man-eating or not, my biggest fear. 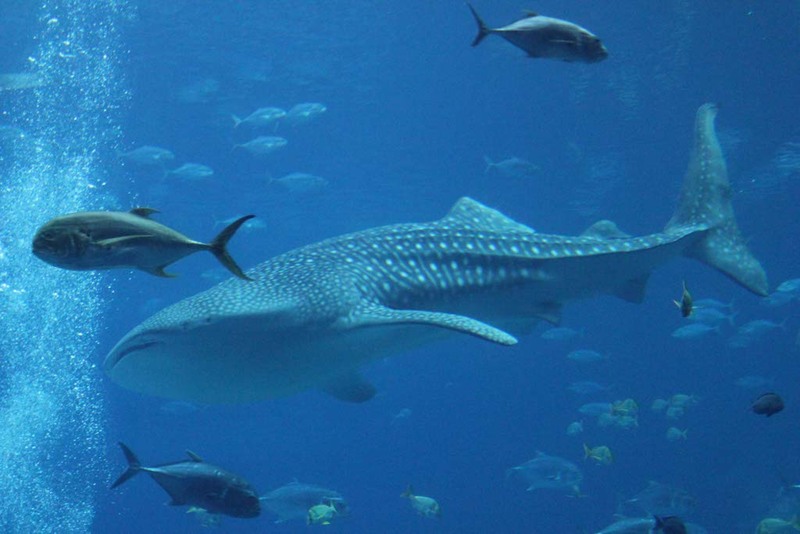 When I heard that the Georgia Aquarium offered an opportunity to swim with whale sharks, as well as countless other marine life, I decided that I wanted it more than I was afraid of it! Journey with Gentle Giants is the only opportunity in the world where you are guaranteed to swim or dive with whale sharks, manta rays, and so many more! We suited up and jumped into the Ocean Voyager exhibit with thousands of amazing animals for the experience of a lifetime and I took control of my biggest fear. The adventure started with a short instructional video that explained the experience. 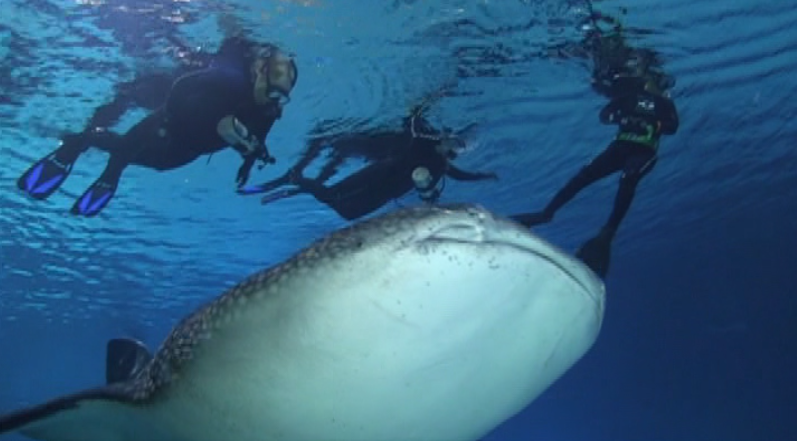 My fear stricken face was blatantly obvious while I watched the four 20+ feet whale sharks swim around on the screen. 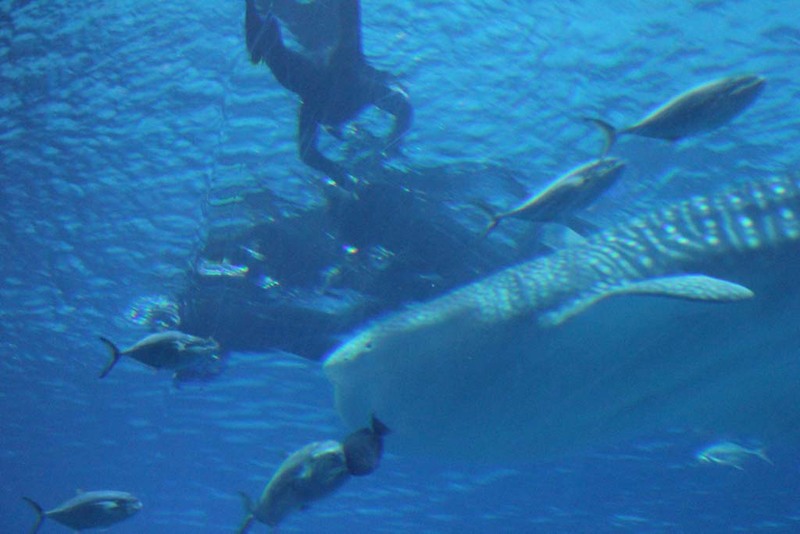 Not only was I going to knowingly swim with sharks, but I was going to swim with some of the biggest ones in the world. We were given our equipment, a mask and snorkel, gloves, booties, a wetsuit, a flotation device, and a compressed air cylinder. As I put on my gear at the edge of the pool, I actually thought I might cry. I was overwhelmed with emotions and the thought of backing out continuously crossed my mind. I took a deep breath and shut off my fear. When I put on the mask, I thought of it as a protective barrier like I was watching the animals through a glass and they were on one side while I was on the other. They couldn’t touch me; I was safe. We descended into the pool, the size of a football field, and the videographer began taping. I focused on her rather than the thousands of fish swimming around me. I even had the mind to wave at her although I didn’t realize it at the time. The first encounter was with a manta ray. It swam so close to me that I didn’t have to reach out and touch it; it brushed my wetsuit. Breathing in the regulator became difficult and I needed to surface to catch my breath. It felt like the regulator wasn’t working properly but I realized I was holding my breath. When I submerged into the water again, something happened…. It was like I opened my eye for the first time and saw the beauty that surrounded me. There was a school of fish within arms reach and they swam around me like I was part of their world. 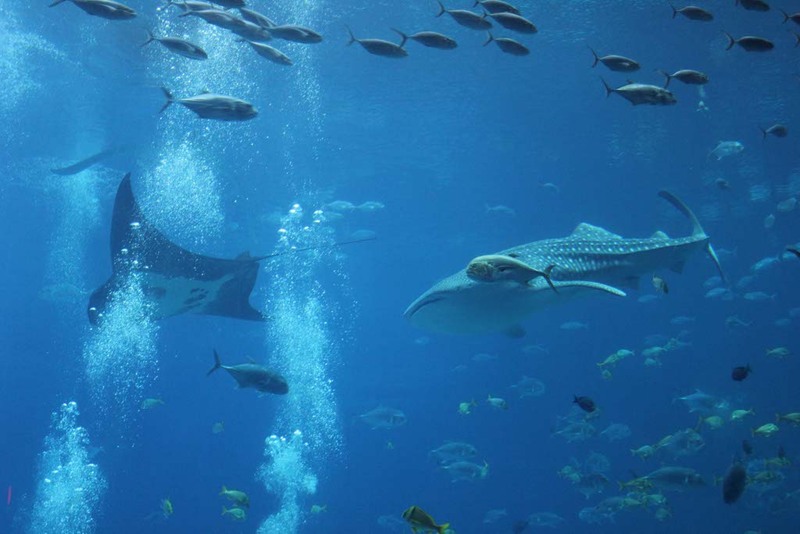 A manta ray graceful glided through the water equally beautiful as a ballerina on stage. Its elegance and fluidity were calming. I was more in control as a consciously breathed in and out. The first whale shark approached me and its mouth was open as if it was ready to swallow me up, but when I truly looked at the 26-foot animal moving toward me, it, too, was calm and graceful rather than intimidating and I somewhat wanted it to get closer. 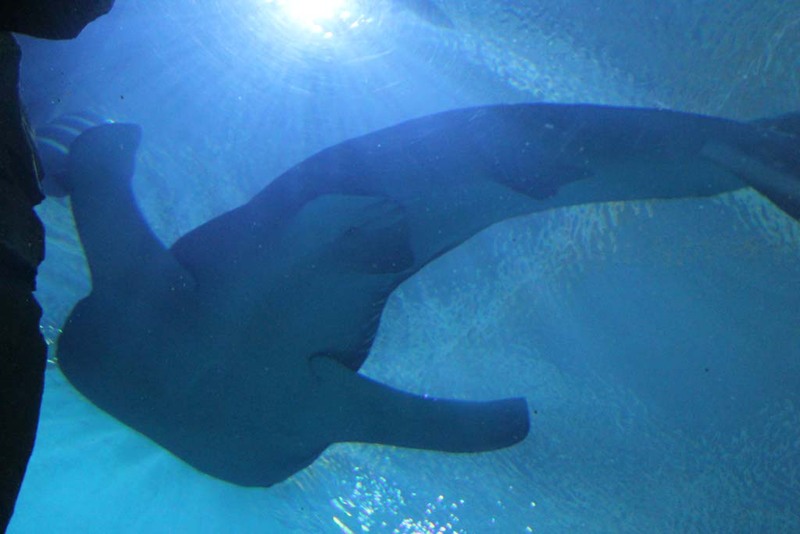 Thousands of people swam with these animals each year at the aquarium and none of them were ever attack or even hurt by these beautiful creatures. They are really are gentle giants. My adventure began with the most fear I’d ever experienced in my life. It was all-encompassing, all-consuming. 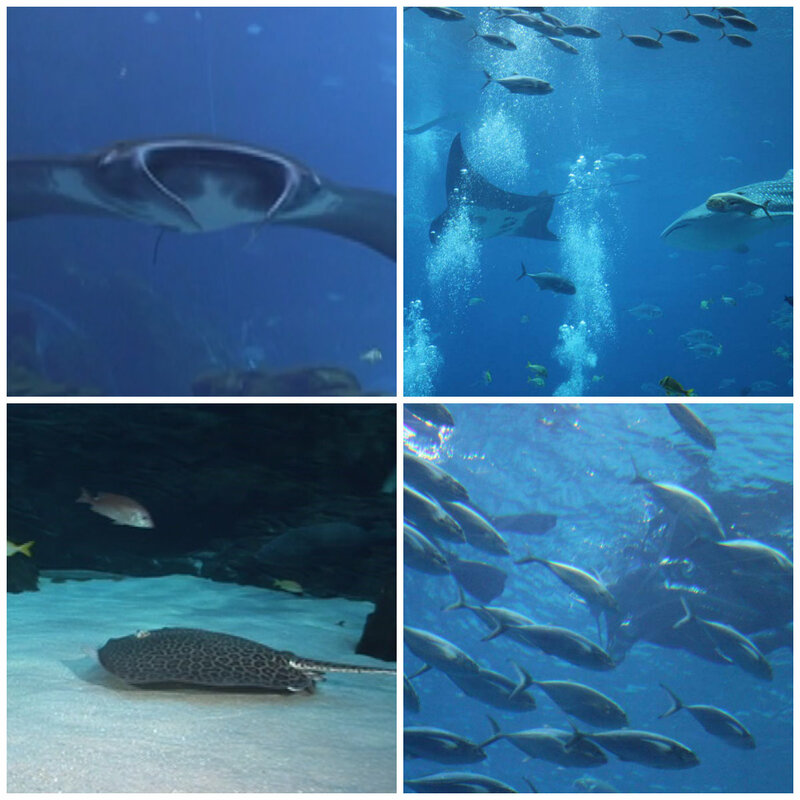 The exhibit houses thousands of fish including whale sharks, zebra sharks, sawfish, leopard whiprays, bowmouth guitarfish, humphead wrasses, pompano, and several species of rays; that’s just to name a few, and I was afraid of all of them. Because I was able to push out the darkness and fear, I experienced one of the most beautiful adventures in my life. PADI certification will appear on my 2013 bucket list! Hi Lesley… was just talking about you again! I encourage people often to visit your site, read your blogs, and re-engage in living again! thank you for posting… the inspiration lives on!